On the Mediterranean island of Cyprus, rural villages, traditional artefacts, even atmospheres and experiences are considered heritage. Heritage making not only protects, but also produces, things, people, and places. 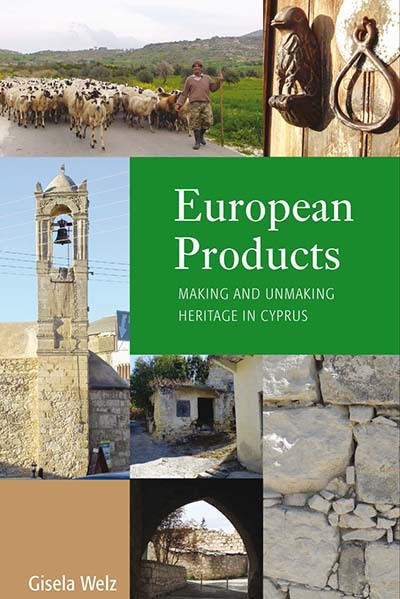 Since the Republic of Cyprus joined the European Union in 2004, heritage making and Europeanization are increasingly intertwined in Greek-Cypriot society. Against the backdrop of a long-term ethnographic engagement, the author argues that heritage emerges as an increasingly standardized economic resource, a “European product.” Implemented in historic preservation, rural tourism, culinary traditions, nature protection, and urban restoration projects, heritage policy has become infused with transnational market regulations and neoliberal property regimes. Gisela Welz is Professor and Chair of Cultural Anthropology and European Ethnology at Goethe University Frankfurt. She co-edited Divided Cyprus. Modernity, History and an Island in Conflict (with Yiannis Papadakis and Nicos Peristianis, Indiana University Press 2006). One year later: What comes after ‘the crusade of greed’?